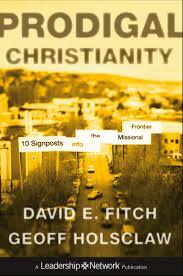 The NuDunkers are discussing the new book Prodigal Christianity by David Fitch and Geoff Holsclaw. Join us for our Hangout discussion on Friday at 11 AM eastern here . If you can’t make the live discussion, don’t worry. We will share the link to the recording on YouTube. As the church lived into its new status both legally and socially in the fourth and fifth century, the artistic presentation of Jesus began to reflect the its ascension to imperial power. This is no place more clear than in the majestic mosaics of Hagia Sophia. The basilica was built to match the grandeur of the imperial city of Constantinople. The mosaic in the large dome, called Christ the Pantocrator (Christ the Ruler of All) drew the attention of worshipers to the elevated ruler, Jesus Christ. Gilded in the richness of gold and hovering above even the mosaic images of emperors and rules, they set the Christ to be worshiped within the imperial context. Now, as the official of the empire, Jesus Christ must also be shown as the emperor, only ruling over all of creation. In many ways, the images we present of Jesus reflect the social position of the church. By the Middle Ages the images of Jesus shifted from the grand imperial mosaics to crucifixion images- often mirroring the death so common in the ages of the Black Plague. Even prior to the Christendom shift of the fourth century, the sketches in the catacombs presented Jesus as the rising savior, standing at the mouth of a whale (echoing the imagery of the book of Jonah) or on the bow of a boat (as in the gospel narratives of calming the sea). These images reflected the ultimate triumph of resurrection, unlike the imperial ruler or the crucifix. We not only depict Jesus in the ways we understand the church in our day, but we depict him in the place that most reflects our imagination of the salvation event itself. There are often two ways of responding to this cultural shift. First, the church can work to exercise its cultural privileged and claw its way back into influence. The other, is to celebrate this shift and view it as an opportunity to explore faithfulness in new terms. Fitch and Holsclaw follow the trajectory of the latter. While it is true that this new Post-Christendom culture has yet to reach the whole of American culture (see my conversation with Isaac Villegas), it is clear that the new day offers us much to consider as followers of Christ. Rather than try to reclaim the place of Christ as emperor (or even president) Fitch and Holsclaw present God as the one who bows, reaches out, even kneels into world, and enters as the prodigal one who ventures into the far country. There are those in the publishing world who have tried to rethink christianity and define what a “New Kind of Christianity” is to look like today. Often, in this mode, these writers venture to deconstruct doctrines of the tradition and present new emerging ideas. Still others, venture to reclaim more radical teachings of the church, in effect elevating the Evangelical roots to dogma. Thankfully, Fitch and Holsclaw take the more Anabaptist rode. It is not the reconsidering of doctrine or the entrenchment of dogma that is required today, but the exploring of how the church itself needs to more closely reflect the nature of God. Like the early Anabaptists, rethinking the Trinity or Grace does nothing. Rather, reassessing the role of the church in world that offers us new ground to cover as disciples. In reflecting Jesus- the God who kneels- the church is more like itself when we take root in nitty gritty of the day to day. Instead of trying to leverage our influence (by numbers or by wealth) the question presented in Prodigal Christianity is simple- How can we more fully embody the Christ who lived, ate, breathed, died, and rose again in the world. Real people, real needs, and actual neighborhoods are then the context in which the church can more fully live into its name- the Body of Christ. Fitch and Holsclaw offer us a breath of fresh air in this new day of Post-Christendom. While we spin our wheels in trying to prop up the church as we have received it in the heights of American cultural Christendom, they offer us a new vision of faithfulness- of being willing to follow the prodigal God into the far country, of letting go of our desires for privilege and power, and seeking to embody more fully the redemption we proclaim. In case you have had your head in the sand or just don’t pay attention to the forthcoming titles on publisher sites you probably haven’t heard that my Neo-Anabaptist, and fellow Chicagoans, Dave Fitch and Geoff Holsclaw have a new book coming in March. Check out their video discussion of why they wrote the book (filmed at a McDonald’s of course). Emergent church guru Tony Jones picked up the video and reflected on the nature of names and how they serve as an umbrella term for a diverse range of folks, many of whom probably wouldn’t be caught dead in the same room with each other. There is some truth to the statement. Yet, it also betrays a fundamental lack of understanding of just what is meant by Missional. Even a basic reading of one or two resources would reveal that what is meant by Missional is not just being about the work outside the church. So to actually answer Tony’s rhetorical test- Of course a leader wouldn’t say he or she is not missional, but it also does not mean they get the general assumptions within Missional Theology proper. A quick glance at the table of contents of Prodigal Christianity reveals just what grounds Missional thinking– “Signpost One: Post-Christendom.” From the early works of Leslie Newbigin, the fundamental perspective of Mission Theology was the Church’s shift in cultural location. While this shift is clearly one still in process, it is evident both from the backlash of the religious right and the recent data on the rise of the nones (those who name no religious affiliation on American Religiosity studies) the church in North America is slipping from its once established cultural pedestal. As I have said in other settings, the logic of American experiment is reaching its logical conclusion. Missional thought, then, isn’t just about getting outside the church doors. Rather it begins with accepting Post-Christendom as a gift for the renewal of radical discipleship. Unlike “emergent,” which purposefully focused on the questions and conversation, Missional Theology begins with this simple core understanding of the Church’s position within the wider cultural frame. While it indeed is a term that gathers together Presbyterians, Non-Denominational, and Jones’ favorite, Hauerwasian Mafia there is still a core imaginary that reaches across the spectrum. The Church is no longer the spiritual advisor to American culture.